Sunday (January 6) is Día de los Reyes and Ontario’s Dragon Loco is celebrating it as only Dragon Loco can. The Chinese-Mexican fusion restaurant will be handing out pieces of rosca de reyes, a ring-shaped sweet bread that is traditionally eaten on Día de los Reyes. Typically baked into the rosca is a baby figurine, representing the baby Jesus. If you receive the piece of bread with the figurine at Dragon Loco on Sunday, you’ll win free food! Looking to bring a little island flavor into your life? Then read on. 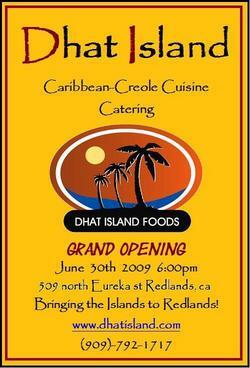 Dhat Island is bringing Caribbean Creole cuisine to Redlands, and is celebrating with a grand opening mixer and sampling from 6 to 8 p.m. tonight (June 30). Dhat Island is at 509 N. Eureka St., at Stuart Avenue, in the former Partners Pantry location. They opened June 23. The restaurant offers catering, lunch pickup and delivery, and will likely be open for dinner soon. Owner Angela Alc and her husband, Carlo, have family from the Caribbean, and Dhat Island serves a fusion of traditional food from several islands. Alc, who has lived in Redlands nearly ten over twelve years, has previously catered in the Los Angeles, San Diego and Orange County areas. For more information, check out this blurb in the Redlands Daily Facts.